Today's first match is between a pair of kiss-off songs from 2008. 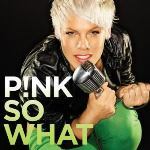 Pink's "So What," the lead single from her excellent breakup album Funhouse, faces off against one of the best tracks by the Pussycat Dolls, "Whatcha Think About That," the Missy Elliott-featuring "Urban Club Mix" of which greatly improved on the original album track but didn't get much airplay as a single, which is a shame (not something Pink had to worry about in the least). For our second pairing we go back in time a ways with a couple gems from the turn of the (21st) century. First up is the great 2001 one-hit wonder by Blu Cantrell, "Hit 'Em Up Style (Oops! )," which faces off with "Shut Up," the 2002 song for which the Black Eyed Peas brought in former Wild Orchid singer Stacy Ferguson to sing the female vocal - and the gig went so well that Fergie became a full-time Pea at the invitation of Interscope chairman Jimmy Iovine. The Black Eyed Peas - "Shut Up"
Which of the Breakup Songs Do You Prefer? Blu Cantrell vs. Black Eyed Peas is a really tough pair. Blu Cantrell channels a great inner power diva payback ballad, but the duel (or dual) between Fergie and Will.i.am changing vocal blows from female and male perspectives creates a great variety. Sorry, Blu, I'm all about Fergie-Ferg.